Now THAT is what I’m talking about. It took the show a week, but Fairy Tail’s Final Season “finally” managed to get back to what made its predecessor series so great. Action, emotional character moments, genuine surprising twists and a nice little tease to wet the audience’s appetite for next week, this week’s episode essentially had it all. Thus, its now, at episode 2 of the season, that I can confidently say that Fairy Tail is really back and just as good as its ever been. I think a good chunk of the weirdness and my own lukewarm reception to the first episode, stemmed from the awkward point at which this season actually from. There just wasn’t a great way to get us back into the swing of things last week, and so I guess my initial expectation of Fairy Tail being the highlight of my week in terms of anime watching, didn’t happen until this week. This week’s episode was stronger yes, and it for sure featured some of the best characteristics of the franchise, but this week’s episode couldn’t have happened in a vacuum. Last week’s episode had the unfortunate job of bringing us back to an arc that had partially started, and it also had to establish Wendy’s situation before we could get the payoff this week. In an ideal world, the payoff and introduction would’ve happened in the same episode, but I don’t exactly want to complain too much. I’d rather a show take things slow and properly develop things, rather than just breeze through to the “good parts”. Too many series have done that recently, and I’m glad that Fairy Tail did not fall into the trap that series like D.Gray-man and Ao no Exorcist Kyoto-Hen did. So… What exactly was so great about this week’s episode? Well, I can point to three major things, which I think really brought back the essential DNA of this franchise into the forefront. The first, was of course the emotional bond between Wendy and Shelia. I’m generally not a fan of time wasted on flashbacks, especially for scenes we’ve already seen before in animated form, but I think every step that the episode took to remind us and develop the ongoing struggle that Wendy and Shelia had as they separated, was a good one. Seeing their first meeting again from the Magic Games was a nice little moment. The way it was laced on top of the present events was also clever. And of course, while predictable, I liked how much Shelia pushed herself in order to try and prove to her friend that she’d be fine on her own. Here’s the thing, its made quite obvious that Shelia doesn’t want to say good bye to a friend she’s become used to being around. The holding back tears, the in tandem working together as they faced off against “Orochil Fin”, it showed us how deep the bond and relationship between Shelia and Wendy had developed. And the best part? It was done by SHOWING, not telling. I know a lot of people like to rag on Fairy Tail for not being perhaps as deep or revolutionary as say Hunter x Hunter or even Boku no Hero Academia, but I do think that the show, story and its creator Hiro Mashima display genuine mastery of storytelling in a visual medium.You’d be surprised at how many shows would get something this basic wrong, and how limited of a group it is that Fairy Tail is a part of. And of course, that scene in the aftermath of the battle, with Shelia and Wendy sharing a tender moment under the tree as they said good bye, that was well done. It was just nice and heartwarming to see, and it made the separation between these two characters all the more powerful. Now, while the separation itself was an emotional moment in itself, what really kind of impressed me was the twist and shattering of expectations that the story had built up only last week. Last week I talked about how it made sense that Wendy had moved on, and how I was a bit sad that that had happened. 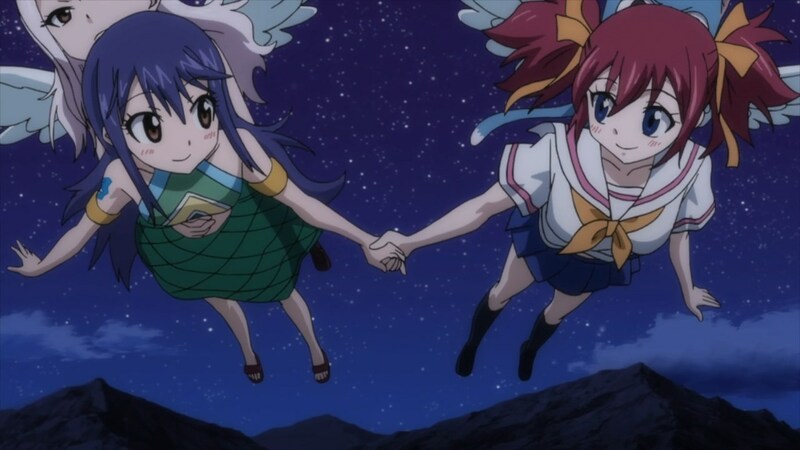 Well this week, the show made note of addressing that idea, and basically revealing that Wendy and Charles had always intended to go back to Fairy Tail, and feelings had only changed because of the attachment Wendy had developed to her friend Shelia. That was a nice little moment, and it cemented a really important fact; Wendy herself wants Fairy Tail to return, and that is INDEED where her heart lies. Had Wendy just been dragged back by force, it just wouldn’t have the same impact. There’s something much more beautiful about Wendy never fully giving up on her guild herself, than her being “convinced” to come back. 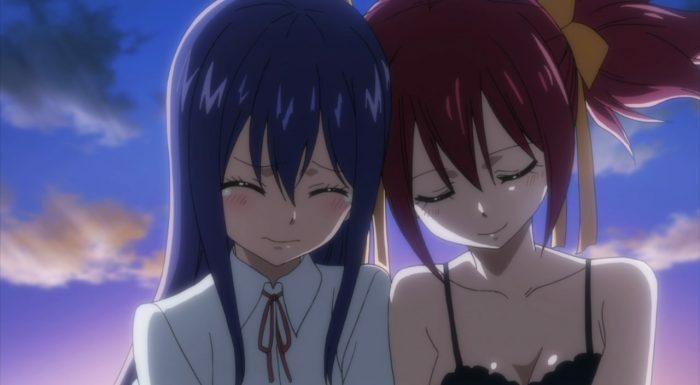 Plus, the moment that almost gave me some tears was Shelia’s whole: “I won’t cry because I WANT Fairy Tail to come back”. That just shows how nice of a person Shelia really is, and how good of a friend she is to Wendy. The little discussion the two have under the tree, is really Shelia helping Wendy come to terms with what she really wants. There’s many good points that Shelia brings up in the discussion, but the one thing that really stood out to me was Wendy’s relationship to Natsu. I guess I had never really realized it until this point, but Natsu has kind of served as an older brother figure to Wendy ever since we first met her all those years ago. It was Natsu who basically found Wendy and had her join Fairy Tail, and its in their shared Dragon Slayer and Exceed heritage that the Wendy has been able to evolve and change. 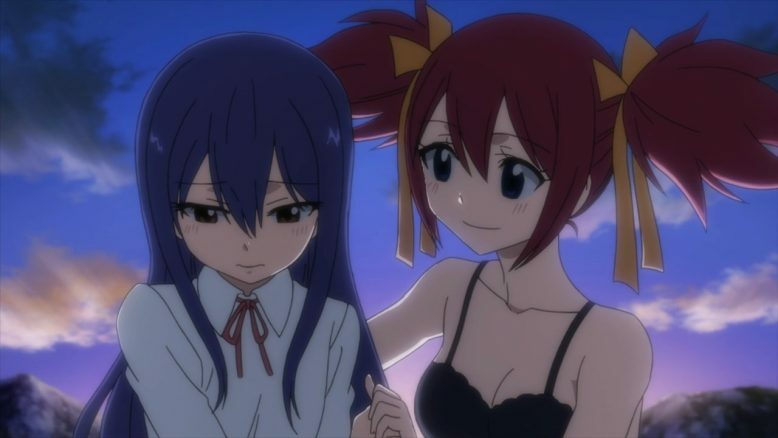 Natsu and Wendy do share a deep connection, and so if nothing else, I think the show did a really good job of starting why Wendy couldn’t have kept up with the disbanding Fairy Tail members. Natsu really was the glue that held a lot of the newer members together, and I love how the show drops this little nugget of information just on the side. 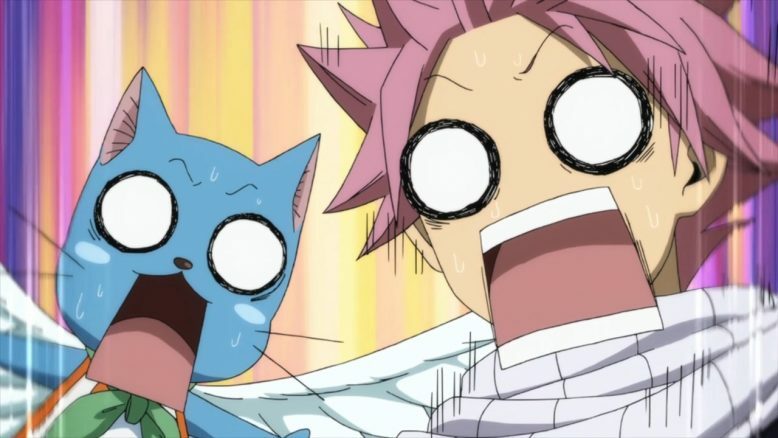 Speaking of which, Natsu I mean, lets talk about the second thing that made this episode so darn awesome; The surprises. The show, ever since its first episode last week, has been hinting at the fact that Natsu has become pretty darn strong. He’s not the man he once was e.t.c. is a great little idea, but the show hadn’t really shown us just how massive of a leap Natsu has taken. Sure we saw him control his flames more accurately last week, but it was this week that we got a real example of Natsu’s growth. I confess, I had forgotten about Blue Note entirely, and it wasn’t until Grimoire Heart came into the picture that I remember. 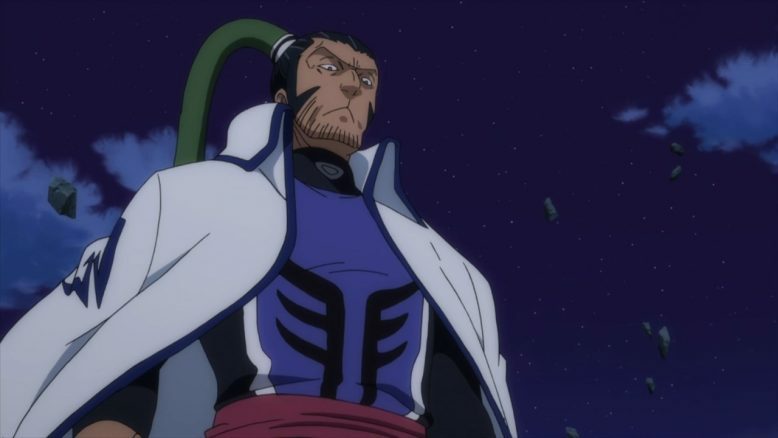 Blue Note, the guy who was basically Gildarts’s equal in power and strength. THAT was the guy that Natsu basically takes on and wipes the floor with, with one friggin attack. 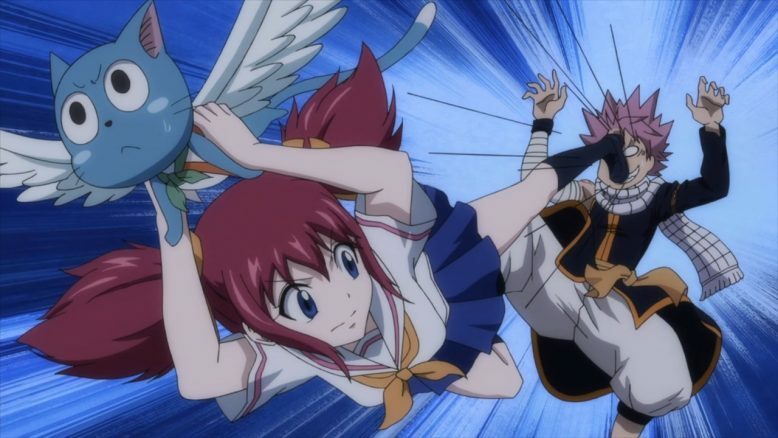 Leave it to Fairy Tail to just surprise and amaze with a moment like that. 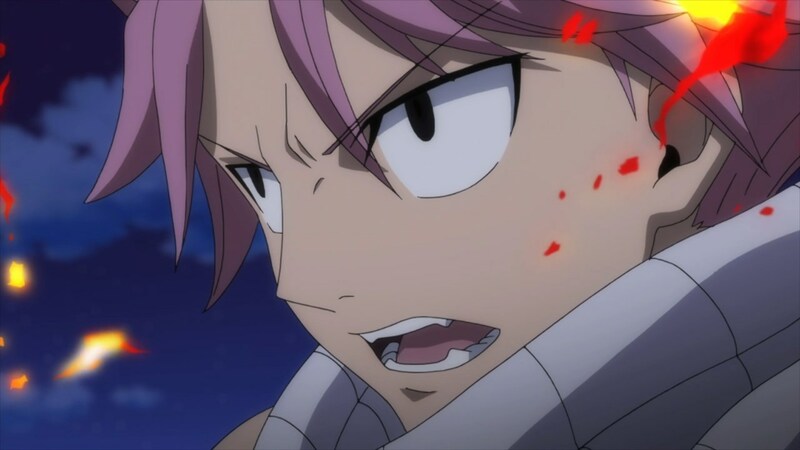 So essentially, Natsu has gone PAST Gildarts in pure power and ability. That is a huge deal, and the way the show just “shows” it by having Natsu take on Blue Note, is both clever and hype inducing. I’m so much more curious about just how powerful Natsu really is now, and what he did to jump THAT far ahead in a year. I’m sure we’ll learn more as the story progresses, but from the action side of the equation, this was a really sweet little surprise. Of course, I can’t mention Natsu without mentioning both Happy and Charles. Man… Is it disappointing to see Happy basically not grow. I didn’t mention it too much last week, but its really starting to gall me that Happy is basically the weakest Exceed now. Charles, for her part, is now not only able to use transformation magic, but she can actively attack and fight in battle. Man, does Happy look bad by comparison, and this is the little dude that I remember being extremely badass in the Edolas arc. The episode where Happy gets super angry and protects Charles? That was one of the few episodes that I’ve ever given an “S” Grade to. Happy was a major reason for that, and seeing him basically be relegated to a comedy mascot side character, is a little disappointing to say the least. I really hope Happy is just playing this all for kicks, and that he actually has some kind of power or growth to show, because otherwise its just not great to see both Panther Lily and Charles basically eclipse him. Plus, I mean, even Lucy has grown a decent bit and is now fighting herself. The idea of her using her Celestial magic to basically power HERSELF up, is awesome, and I’m glad that my favorite female character ever, is now even more independent and strong in a way that feels organic to her character. I definitely could spend a good chunk of time talking about why Lucy Heartfillia is an awesome character, but I think I’ve done that a lot over the course of covering the last two series. I’ll just pause on this particular topic and say that I’m excited to see what else Lucy has up her sleeves. I’m sure we’ll be seeing more from her, as the show trucks along. And that I think, about covers all the major elements of the show, except for maybe the third and final one. 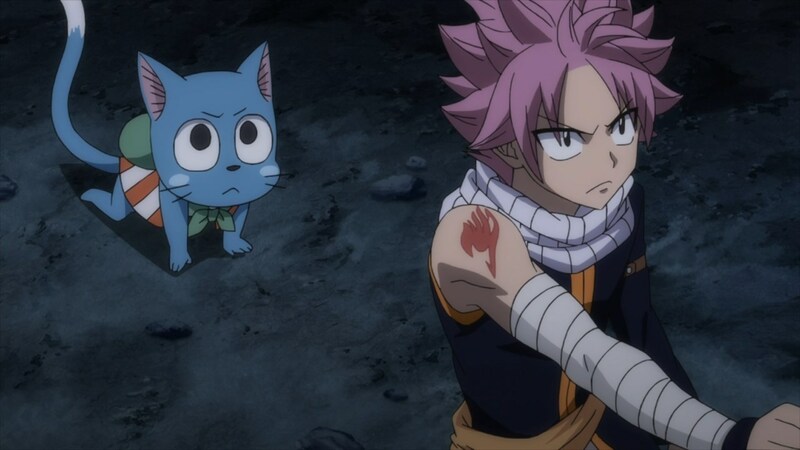 One of the things that I really adored about both the first and second Fairy Tail series, was in how it not only gave us a good chunk of story per episode, but in how it would also set the seeds of excitement for what was coming next week. This week’s episode, thankfully, was no different and hinted at the next member of Fairy Tail that we’re going to go and see; Juvia Lockster. 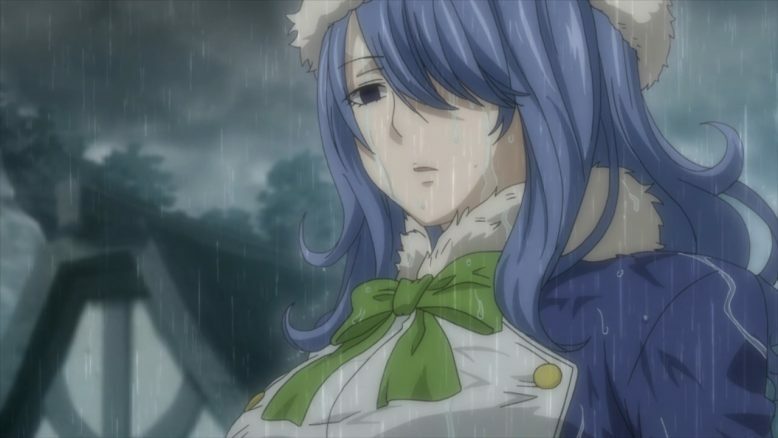 The whiplash from seeing Juvia alone, crying and depressed in a “town” where the Rain never stops, is intense. From what we’ve seen of Juvia in both the first episode and in the Opening theme, she’s right beside Gray and really happy. The fact that, one year later, when we get back to her she’s basically by herself? Well… There’s A LOT of questions raised by that fact. Did Juvia and Gray break up? What happened between them? This is all pretty insane, plus the fact that none of the other Fairy Tail members have reached out to her, and that she’s basically gone back to what she was before she joined Fairy Tail. I’m really excited to see what the deal with Juvia is, and I can’t wait for next week’s episode. THAT, is the feeling I want to have after watching an episode of Fairy Tail. I want to be content with what I got, and I want to be eagerly anticipating the next week’s episode. MAN, does it feel great to have both of those things back, once again.